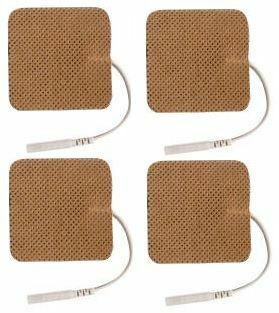 TENS Pros Premium® TENS Stim Electrodes 1.5" x 1.5" Square, Tan Cloth, Carbon Layered, TENS Pros Gel, Reusable electrodes. Sealed in a poly tamper proof pouch. 4 electrodes per pack. Premium Tan Cloth backing is comfortable, durable and safe. TENS Pros Gel is made in the USA and is the economical choice. Self Stick, durable and lasts for up to 10-15 uses. Open the tamper proof foil electrode pouch. Save pouch for later storage. Remove electrode from package and peel electrode away from release sheet. Save release sheet for later storage . Attach electrode lead wires to TENS unit or other device. These electrodes are the best in quality and price that I have found to date. I will order these again and recommend anyone needing electrodes to give these a try. This pads are exactly like the originals. They work perfect and came at a super low price. I highly recommend them. I love the cost. I love the availability. The problem I have had with many products is My body runs HOT. The adhesive sticks at first, after 20 minutes they come loose and I get electrocuted. Im looking at the other electrode pads to see if there is a thicker stronger one. I love love love the tens unit. I have actually used gorilla tape over the pads. These electrodes conduct as well as the larger ones; and I've had some sets that lasted longer than expected. However, the gel is considerably thinner on these and the weight of the TENS lead wires tends to pull them off my back more easily so they stick to my clothing, even though I tape the lead wires to my side to reduce pulling. Also, have had several wires rip out of the electrodes and it felt like I was being jabbed with long needles. Ugh. This did not happen on the larger 2" size. If the gel was thicker, I might like these better. The jury is still out. Not sure if I'll settle on this or the 2" square size for the long term. Still like the material and gel on these better than the competition, regardless of the other issues mentioned above. I was not happy with the length of time the sticky stayed on the pad. I have to moisten pad with each use. These are exactly like the pads that came with my Tens unit. My local drugstore wanted $20.00 for two (large 2x2) pads. These pads are better than the original. They have better adhesion, softer, more flexible. Replacement ones from my local Tens supplier are $12.00 per card. Great savings. Ordered replacement electrodes. So glad I can order these online. Quick and Convenient. I was very happy with the electrodes I received. They fit my TENS unit, and are a fraction of the cost a health supply store was charging my insurance company. Buying them here was less money, paying out of pocket, than going through the health supply store and my insurance co. Delivery was fast. Good quality Product at a reasonable price. Very satisfied with service. Q: Are these self sticking and will they work with an electromedical solutions tens 2500 unit? These particular electrodes are actually discontinued by the manufacturer, but all of our pads should work just fine with your unit.